Spring is the season of love, new beginnings, and flowers everywhere. Here are our top spring wedding colors for anyone getting hitched between March and June. 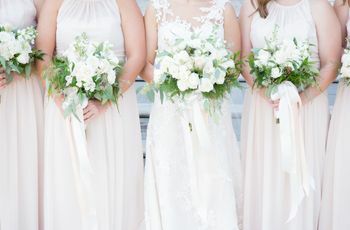 Pastels are definitely mainstays when it comes to spring wedding colors, and while a good pastel wedding will always make us melt, soft hues like blush and periwinkle blue aren't your only options if you're planning a springtime wedding. 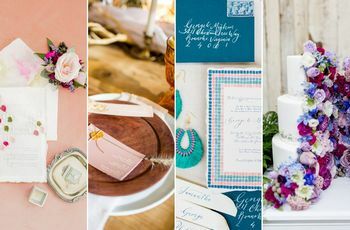 We're here to share some of our favorite spring wedding colors, from bright, floral-inspired hues to trendy neutrals — and for those of you who really have your hearts set on a blush wedding, a few stunning ways to use pastels (we couldn't resist!). 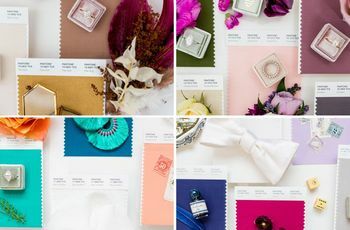 These details prove that spring is one of the loveliest times to get married, but if you need even more ideas, you can check out this romantic garden-themed wedding inspiration or use the WeddingWire Color Palette Generator to find customized color combos. 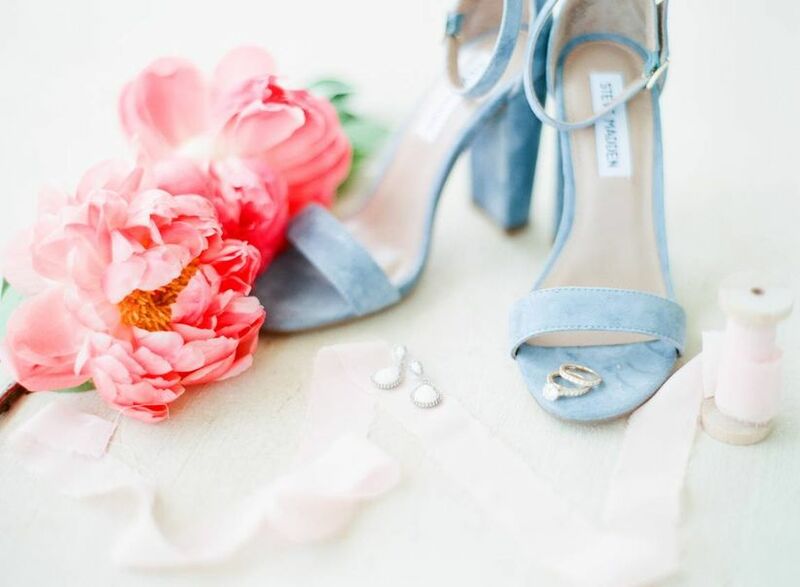 Ready to finalize your spring wedding colors? Use these ideas to get inspired. Yellow is a quintessential spring color, and we love how cheerful it looks when paired with a soft peach accent. This citrusy color combo is also quite versatile, and it can be as whimsical or as elegant as you want, depending on how you spin it. 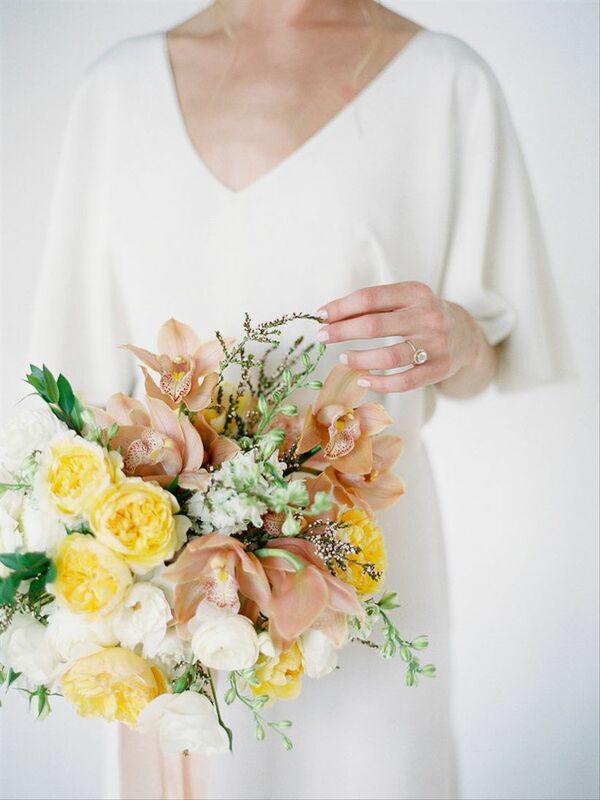 With a minimalist wedding dress, this peach cymbidium orchid and yellow rose bouquet is utterly sophisticated. 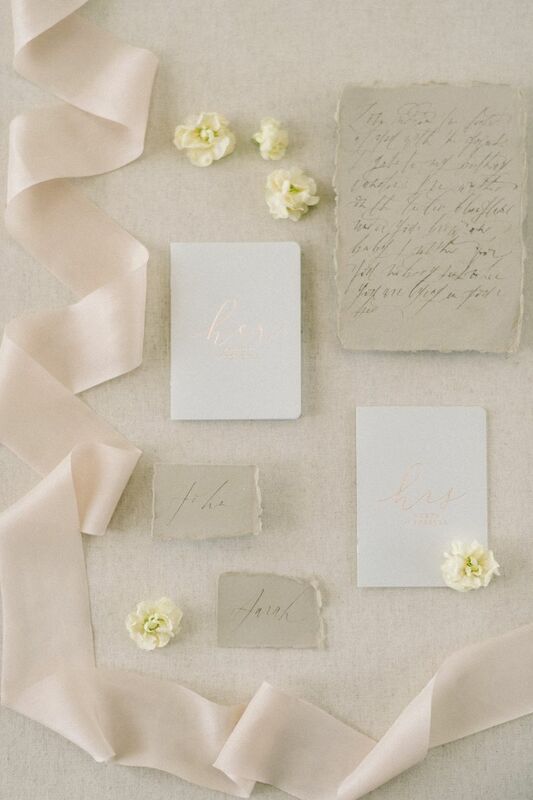 Neutral tones are also some of the prettiest spring wedding colors. 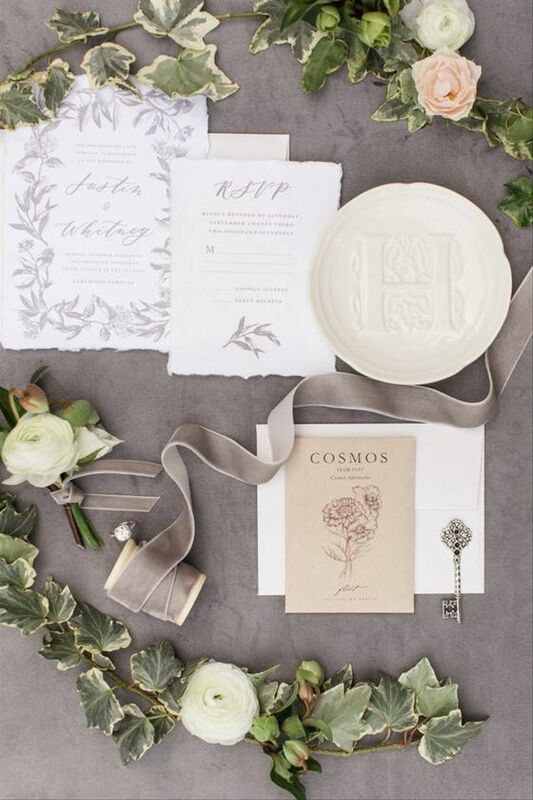 Take a cue from the season by pairing greenery with white flowers and gray accents (love that velvet ribbon!) for a stylish palette. These ivy branches feel especially romantic and would be lovely for a springtime garden wedding. A spring color palette for the ages. This iconic duo never goes out of style — keep it fresh by using the palest shade of blue to really let the pink hues stand out, and add neutrals like ivory and beige to round out the palette. Now, let's talk about those magnolias. If you're going for modern ethereal vibes on the big day, blue and white are some of our favorite wedding colors. These hues are super romantic while also feeling clean and uncomplicated. 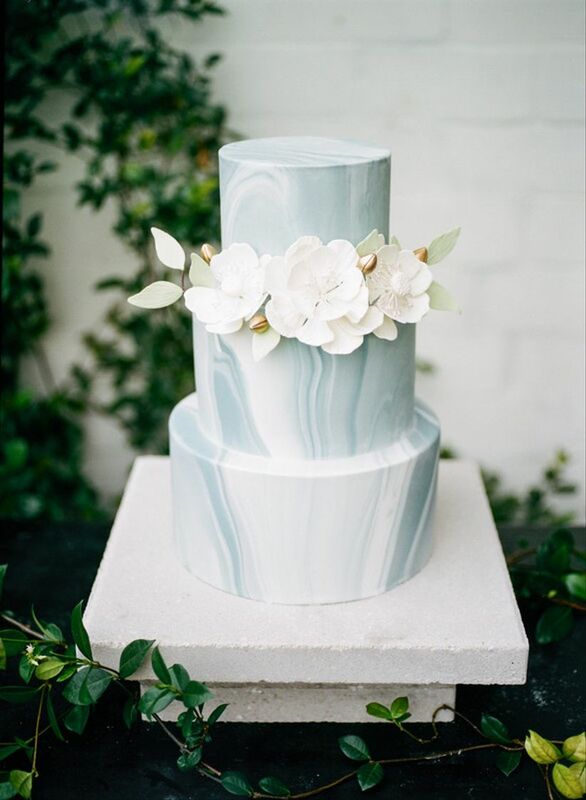 Blue looks its best when you use a variety of shades — this marbled fondant cake shows that you don't need to stick to just one. Looking to go bold with your spring wedding colors? A fuchsia and orange palette is feisty and fun. These bright colors are great for adding instant personality to blank slate venues, like lofts and warehouses. Plus, they set the tone for an upbeat event. Put a spin on basic blue and pink by using navy and blush instead. 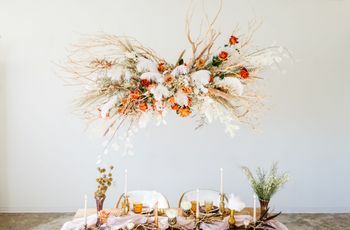 This color combo is popular for vintage wedding style and is easy to adapt throughout your decor, from floral arrangements to stationery and table linens. The navy blue adds formality if you're getting married at a fancy venue. 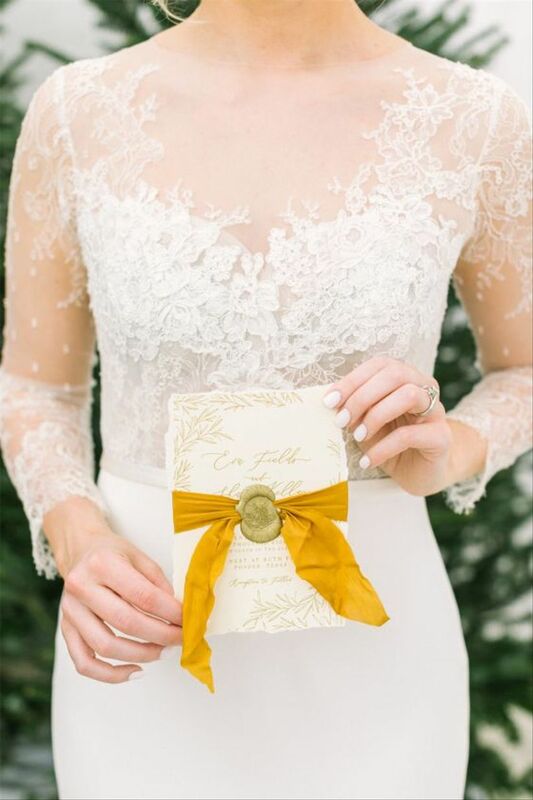 One of the latest wedding trends is to pick a color (yup, just one!) and use shades of it throughout your decor. 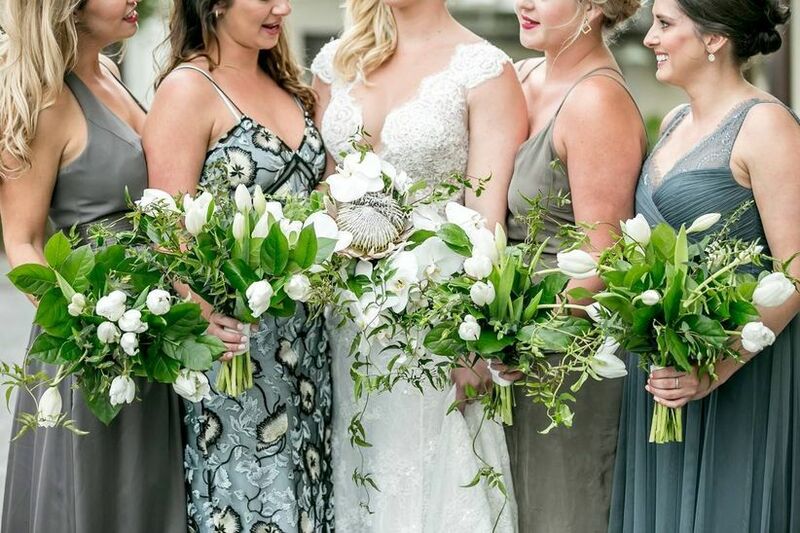 Take these green bridesmaid dresses as proof that sticking to one color family can be seriously gorgeous — this group wore dresses in sage and viridian green hues, then added greenery-filled bouquets to complete the look. Another way you can get on board with the monochromatic wedding trend: purple. 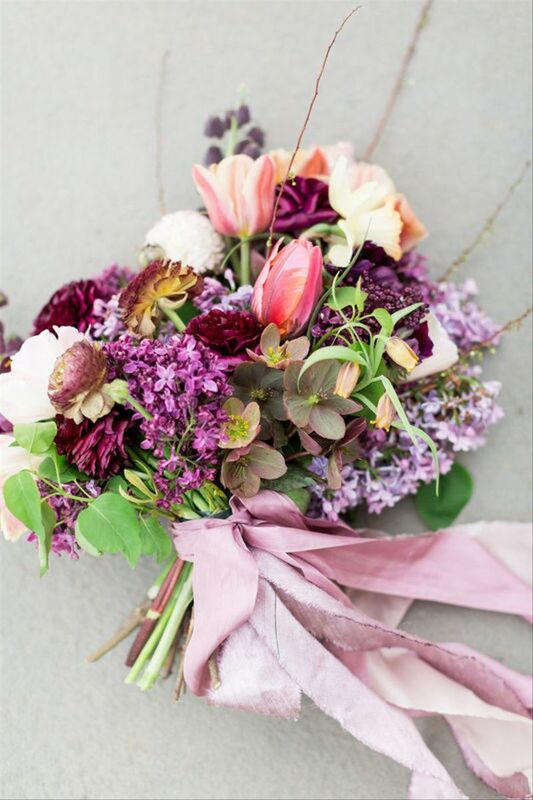 This combination of lilac, plum, and amethyst is perfect for a spring wedding (this vintage wedding inspo has even more purple wedding ideas). 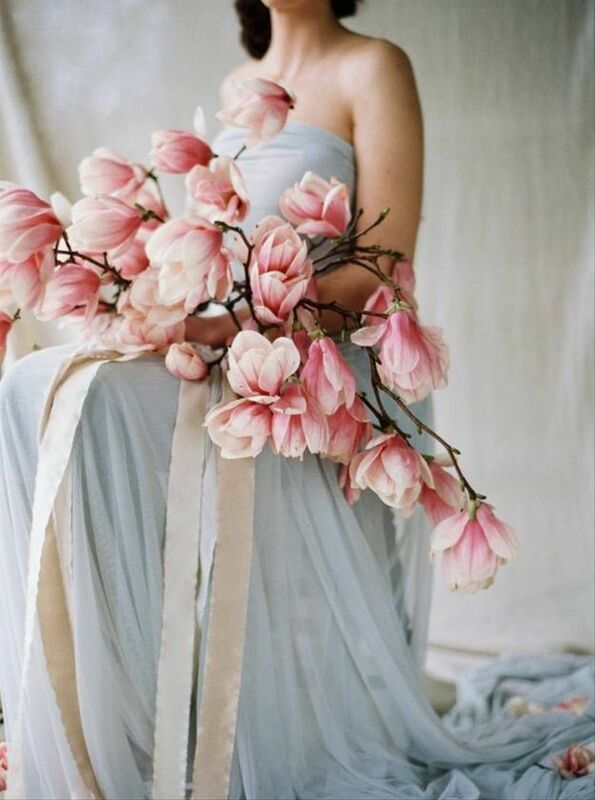 These spring wedding colors are a bit more unconventional, but they're irresistibly pretty. 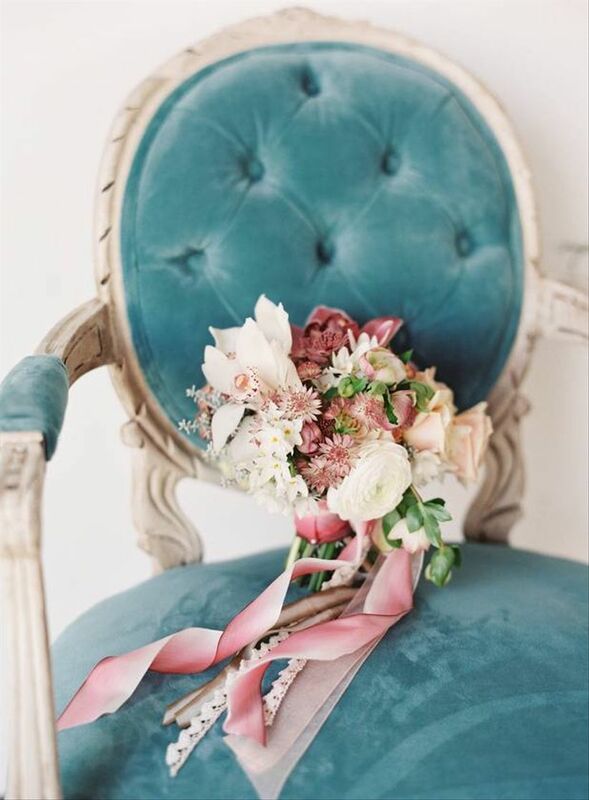 We typically see pink paired with blue, purple, or green for spring weddings, so we love this subtle twist using the teal. This combination feels very sweet when paired with accents like antique furniture, lace, and velvet. For a mostly neutral palette, try accenting barely-there blush with ivory and cream tones. Hints of shimmering metallics, like rose gold, add extra romance and luxe. 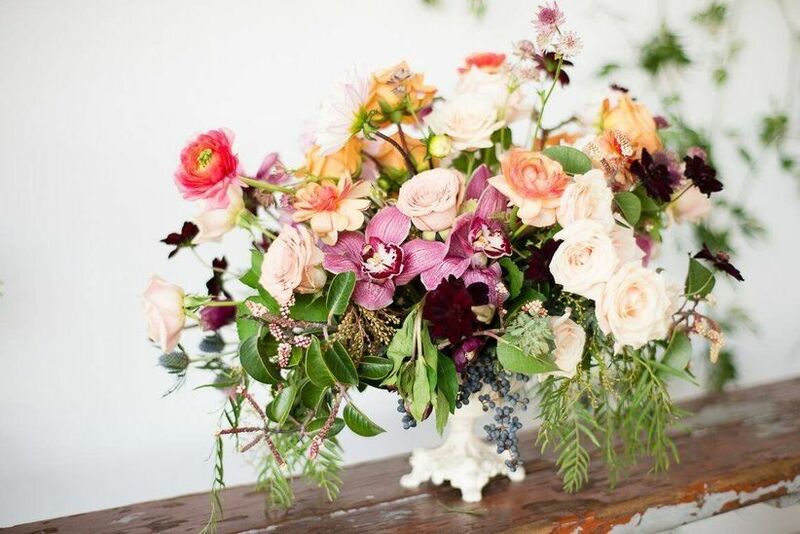 We envision this color palette at an exquisite castle wedding venue or European-style garden. 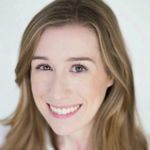 Calling all playful and preppy couples! This color palette is eye-catching and energetic. Blue and green are relatively classic colors, making them ideal for traditional-with-a-twist weddings. 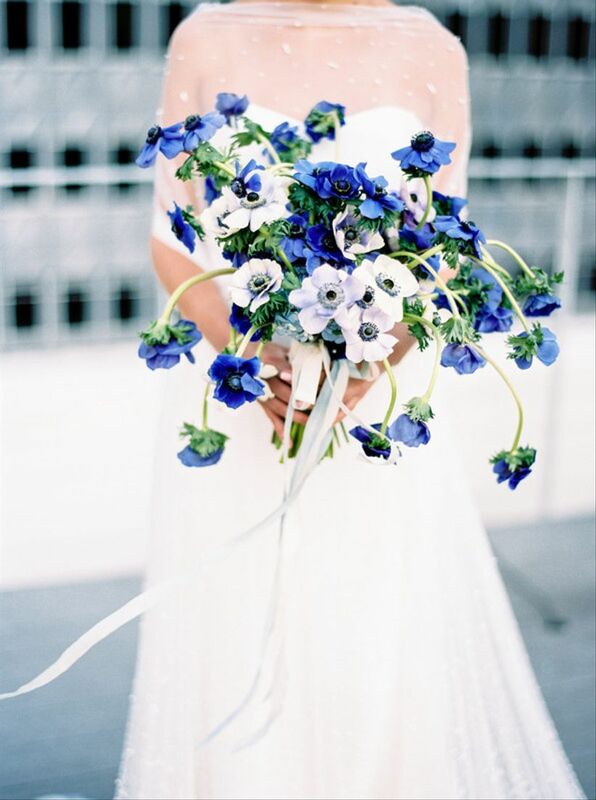 Incorporate bursts of blue with flowers like anemones, delphinium, hydrangeas, sweet peas, and forget-me-nots. Hello, beautiful. A color palette of white, lilac and gold exudes elegance. For the most refined look, concentrate on using mostly white, with touches of lilac and gold to add just enough color. 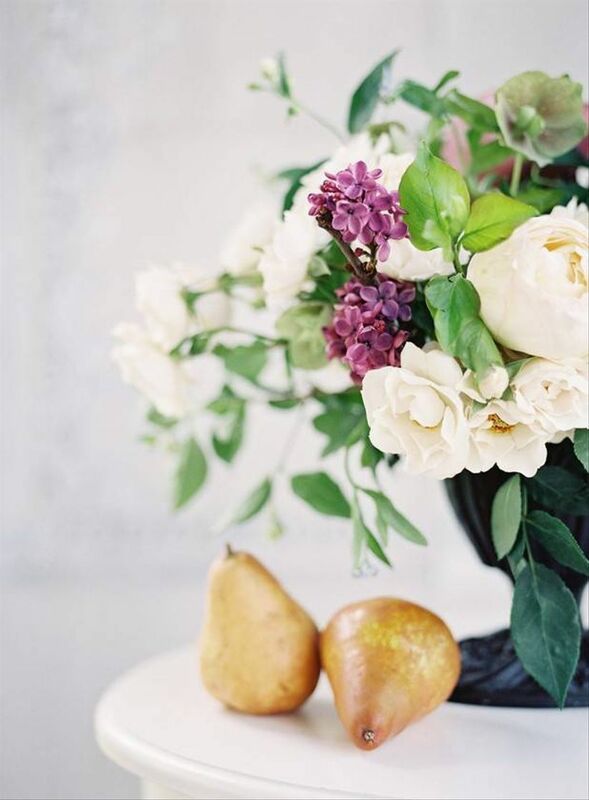 This centerpiece (which features actual lilacs, of course) reminds us of a painting you'd see in a classical art museum, and we love the addition of two golden pears inspired by the fruit as decor trend. 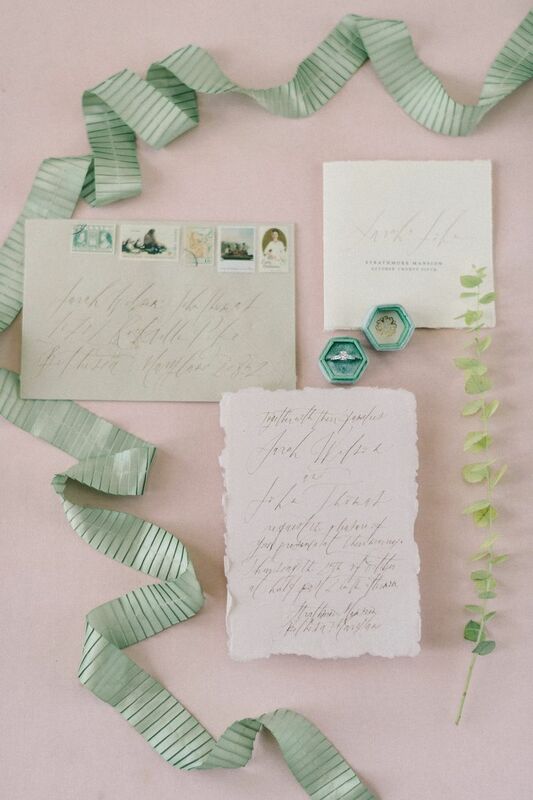 These are two of the most harmonious spring wedding colors we could imagine. The muted olive green keeps the blue from being too pastel-y. If you haven't heard by now, the 2019 Pantone Color of the Year is Living Coral. This vivid hue has already started making its way into wedding decor (don't miss the rest of this year's top wedding colors) and it's a perfect fit for springtime events. 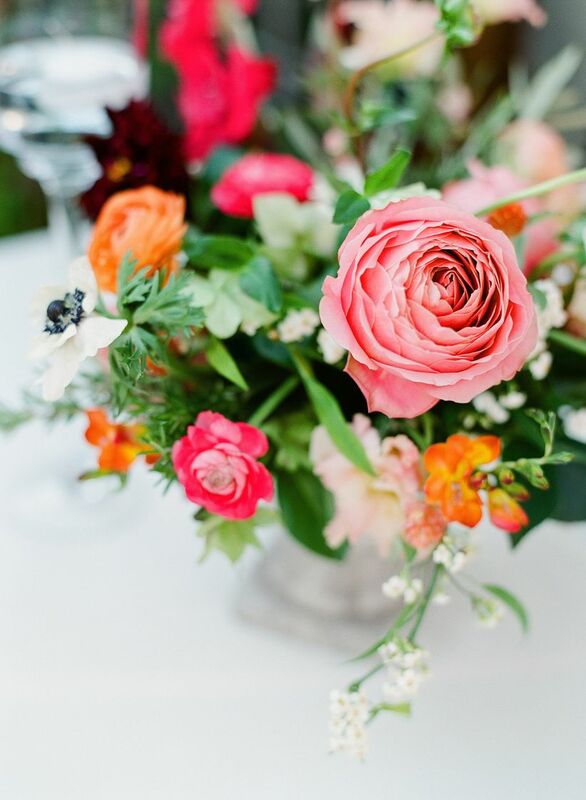 After a long winter, the orange-pink color is like an instant dose of sunshine for your wedding day! We especially love Living Coral for floral arrangements, wedding invitations, and place settings. We're kind of obsessed with this bold yellow color. 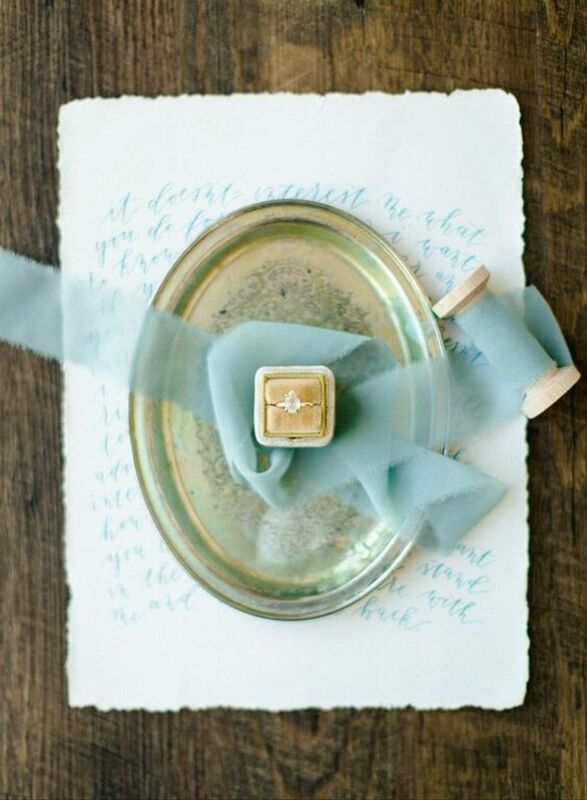 The trick to using such a vibrant hue in your wedding decor is moderation — notice how the rest of the details on this invitation are neutral, with a gold wax seal being the only other source of color. The end result? A totally chic (yet unexpected) look. 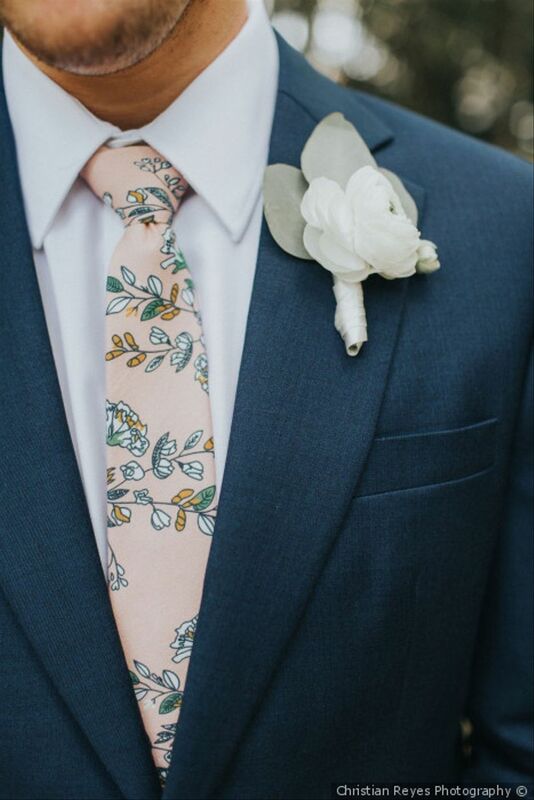 These are two of the most popular spring wedding colors for a reason: they just look good together. Whether you're having a countryside garden wedding or getting married in a swanky ballroom, blush and mint always come through. 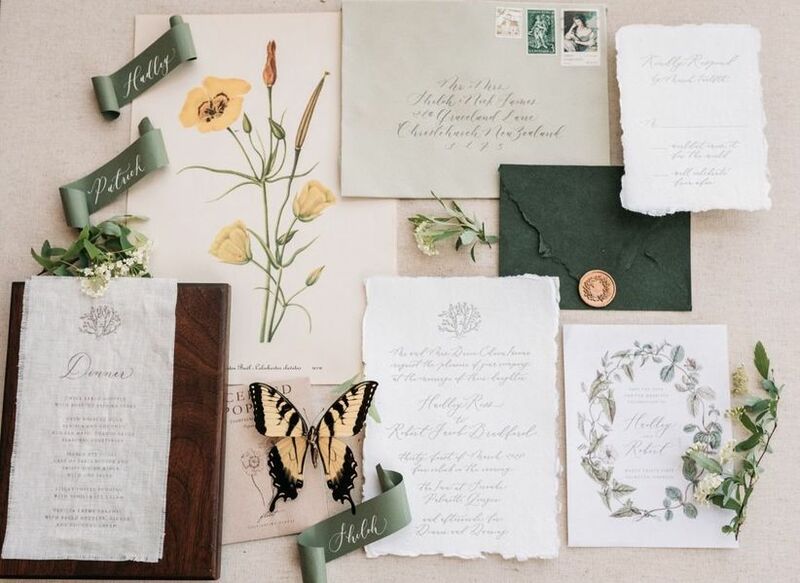 Celebrate the season of renewal with a woodland-themed wedding filled with botanical details, like butterflies, greenery, and vintage floral illustrations. A color palette of yellow and moss green adds to the nature-inspired theme. While spring is associated with pastels and bright colors, sometimes a lack of color is just as gorgeous. 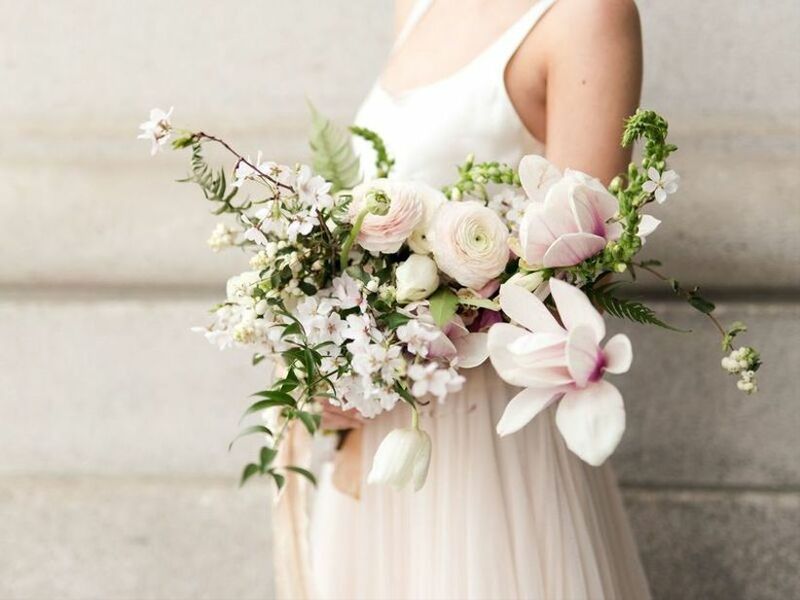 An all-white wedding is very springy — we're crushing on this white bouquet with understated hints of pink.